Label Removers are a variety of tools used to help you change pricing quickly and efficiently. Label remover can be many different things. 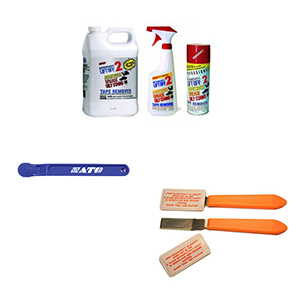 Here are the 4 label removers that we offer at American Retail Supply. Metal label scrapers are designed to help you peel off labels with minimal effort. Use the plastic label scraper on product that is more delicate, and you do not want scratches on. Silicone lubricant is use for removing the adhesive backing on a label. Lift off is a lemon scented label remover. You can spray it on your labels and it will remove any sticky residue from your items. Please contact American Retail Supply with any questions and speak with one of our product experts 800-426-5708.